This was the final assignment for studio based on trends and topics from AIGA’s Designer of 2025 series. After facilitating and participating in workshops throughout the semester, we picked our favorite concepts to create a “Final Thing.” My "Final Thing is a dynamic and interactive data visualization created with “recently played” statistics aggregated from audio applications such as Spotify. The Final Thing originated from concepts established throughout the workshops we participated in during Studio this semester. While all the workshops effected my thought-process, three of them specifically informed my formal choices throughout the creation. Data portrait I created using my “Recently Played” data found from my Spotify and Apple Podcasts applications. The bolder artists/shows are my most frequently listened to. Sketches from the workshop about re-imagining the list format. While going through my notes I began to see how these sketches could help inform how I organize and display the listening data for the Final Thing. The Final Thing is a dynamic and interactive data visualization created with “recently played” statistics aggregated from audio applications such as Spotify. These statistics are filtered to create a unique data visualization for each individual. With that, there are many possibilities of the platforms and devices in which it could live. Listening statistics from Spotify are filtered through a process of categorizing by artist and album. Then, that data is organized into the sequence that will be seen in the data visual. Here is an example using my 50 recently played artists and albums from Spotify. On the left side you can see multiple albums by the same artist (different values adjacent to same hue.) While colors may repeat themselves, they aren’t associated unless adjacent to one another. When the visual is displayed and becomes dynamic, the colored bars (representing the listening statistics) will blend together. Even with the blending, you can still see the difference between an artist with multiple albums and one with a single album. The movement of the visualization mimics the rhythm of the music being played. Regardless of the intensity of the movement, the colors are intended to blend and move with one another but remain somewhat in the original location. 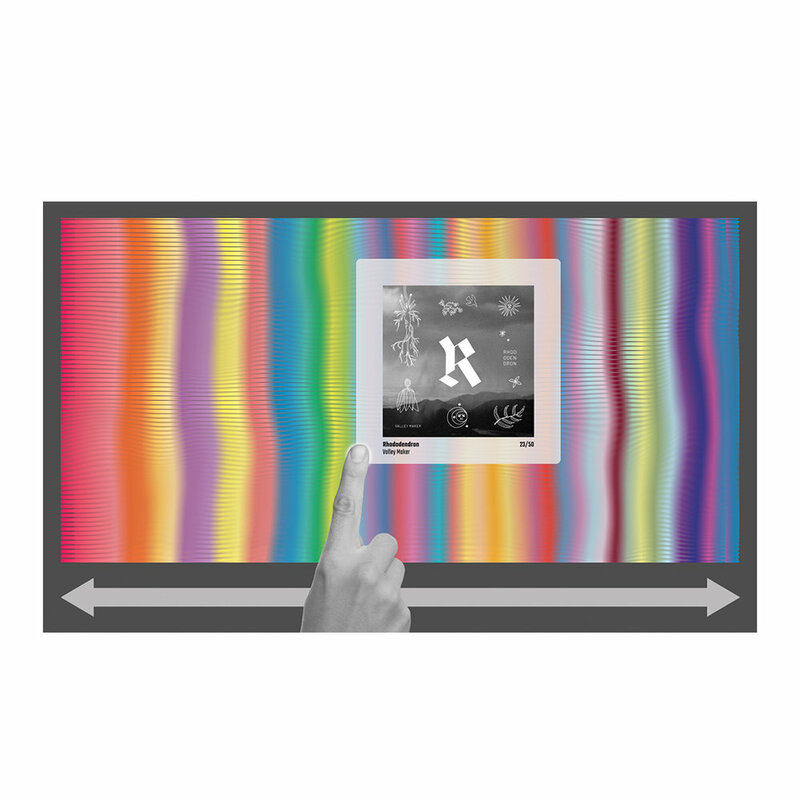 When the visualization is displayed on a touchscreen device, users are able to drag their finger across the screen to browse the albums and artists. When the visualization is moving, the original position of the data determines what is displayed. When hovering over a specific spot, the user sees the artist, album, album art, and its’ ranking within the organization method. By tapping the album art, the user would be prompted with the ability to play the album through native platform. This interface allows for multiple other interactive possibilities with the data. The interface created for The Final Thing allows for adaptability across a variety of platforms and devices that may or may not currently exist. A basic idea would be an iPad or desktop application; while these ideas are extremely feasible, they might not be overly interesting. 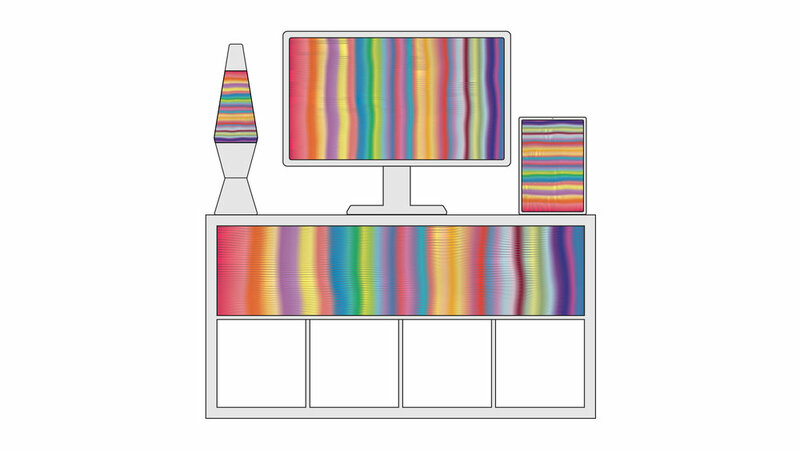 A lava lamp might not be extremely useful, but it could provide an unique experience between the user and a desktop object. And finally, if one day touch screens were built into shelving units— browsing a friends’ listening data would be quite the experience.